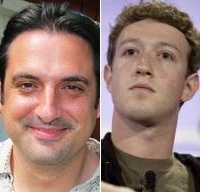 Two news stories involving Facebook and founder Mark Zuckerburg have reacently made headlines - one involving Zuckerburg stealing the idea from two funny-named Harvard twins and the other regarding a person (Paul Ceglia) claiming a 50 percent ownership in the company that has been ignored for years. The 9th U.S. Circuit Court of Appeals upheld a previous ruling on Monday that denied a request from the Winklevoss twins (Cameron and Tyler), along with Divya Narendra, preventing the three from backing out of a settlement previous reached with the corporation a few years ago. Now that the Winklevoss' are out of the equation, Ceglia, a New York businessman, has reared his head with new evidence proving his claims that he is part owner of the multi-billion dollar company, presenting numerous emails showing a correspondance with Zuckerburg, in which Zuckerburg acknowledged a deal had been made granting Ceglia a 50 percent stake. Facebook insists the emails are fraudulent. Some may question why Ceglia never presented these emails earlier and why now he comes out with them. Perhaps Ceglia was waiting for an outcome on the Winklevoss appeal - with the courts ruling against them and any possible future claim they may have against Facebook, Ceglia was now free to present his evidence against the company. Had the courts ruled against Facebook, Ceglia may have had to faced reduced ownership in the company, sharing with the Winklevoss twins and Narendra, or worse, had the courts ruled Facebook was stolen, Ceglia could have faced getting half of nothing, which would be nothing. Now that the other Zuckerburg challengers are out of the question, there is a bigger piece of the pie left over for Ceglia.